All photos © Neil Aird - Plus a few by © Tom Baillie where noted. 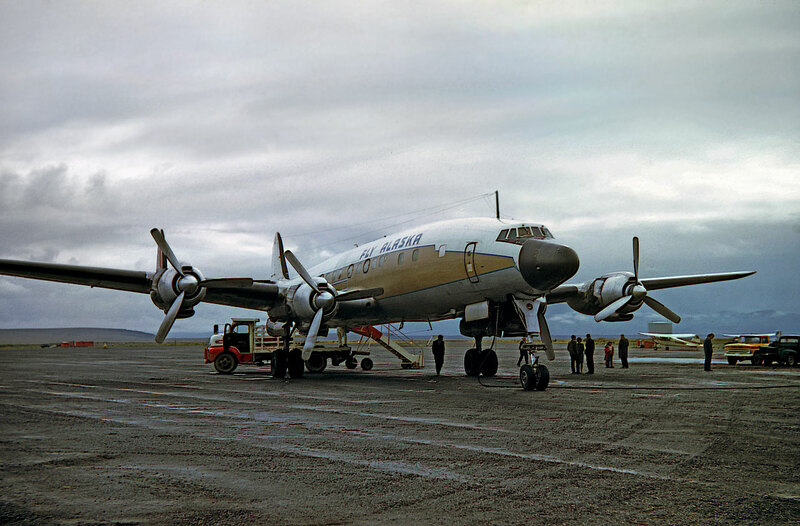 Alaska Airlines N7777C "Flight 301" at Unalakleet - 31 August 1966 - Touched down 09:45 wheels up 10:21 local. 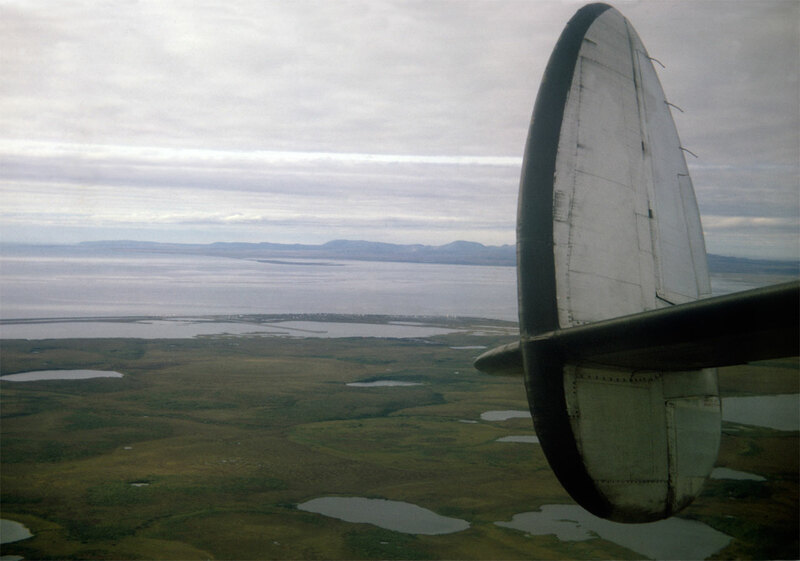 Next landing Nome at 10:59. Time to stretch my legs. Departing off runway 33 is N2708R Fairchild F-27A (39). Crossing the Arctic Circle, passengers getting certificates (only if you were on the special tour!). Captain made the aircraft bunt up and down as a way of telling us!! 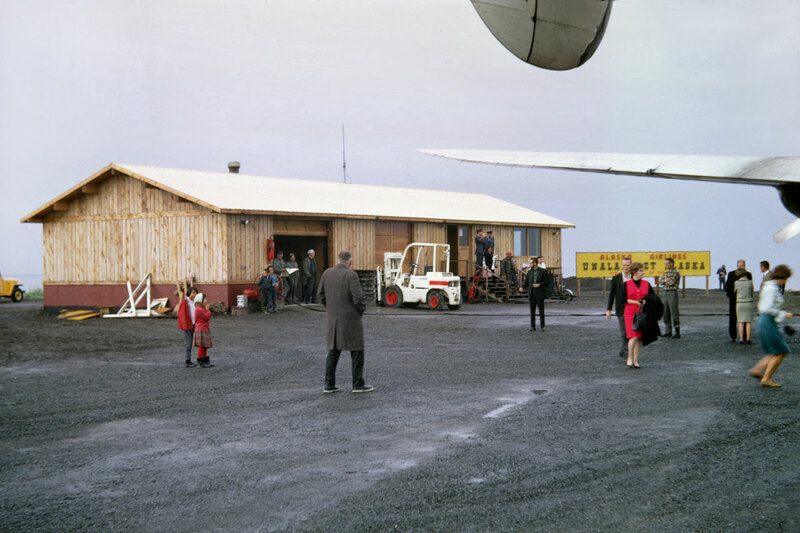 The Terminal at Kotzebue. Nothing fancy. I enjoyed my three hour walk around town, interacted with my first Eskimo people. Quite something for a 21 year old from Scotland. I realised then just how far I was from home. 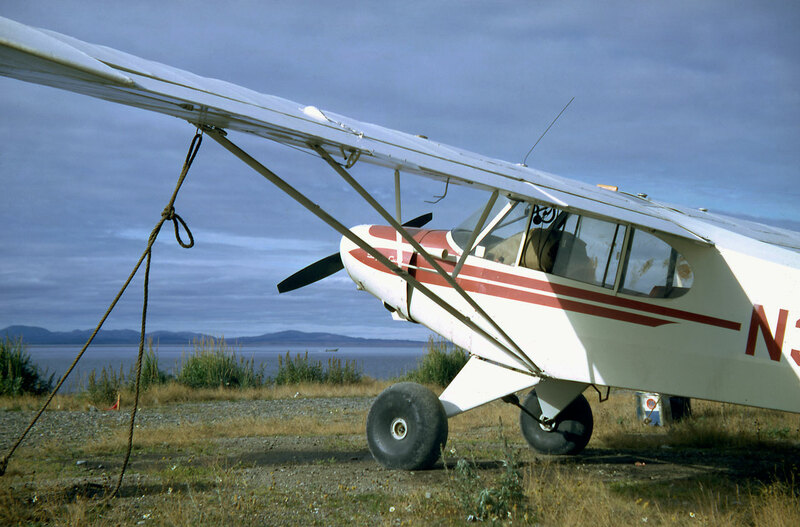 One of five Piper PA-18A Super Cubs noted at Kotzebue, a great runabout vehicle, still very popular in 2014! 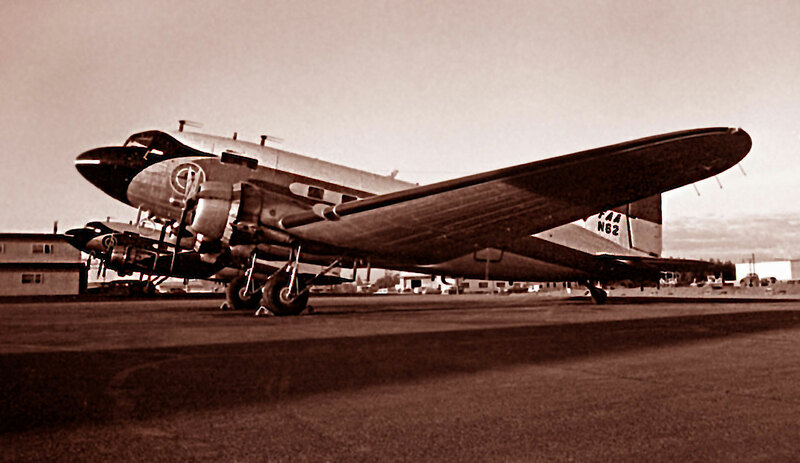 Even with just twenty minutes on the ground, there was time at McGrath to deplane, go into McGuire's Bar (one room shack beside runway) and have a whiskey, bottle was given and taken to table, I was treated by a drunken FAA guy (off duty!) and then Jenny, the Stewardess, had to come into the bar and tell us the flight was boarding!! As we left the bottle was returned to the bar and the drinks paid for. 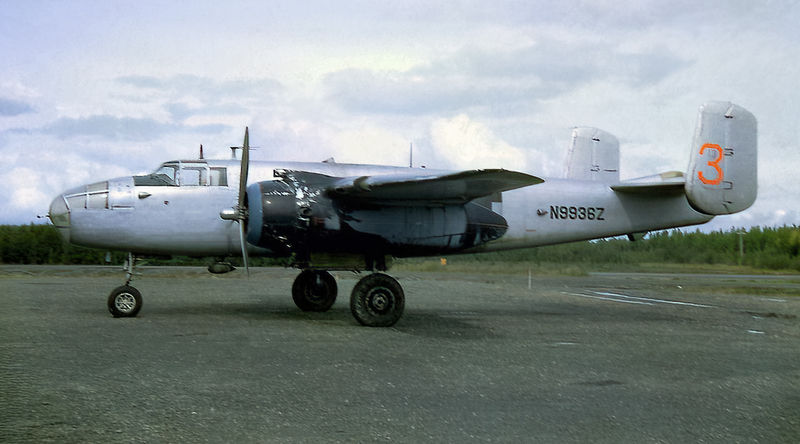 N4824E Douglas A-26B Invader (28004) ex 44-34725. Over ran end of runway at Homer on 29 October 1966 shortly after I took this image on 31 August! A rather grainy shot of N7777C taken the following day, starting the same flight, without me this time. 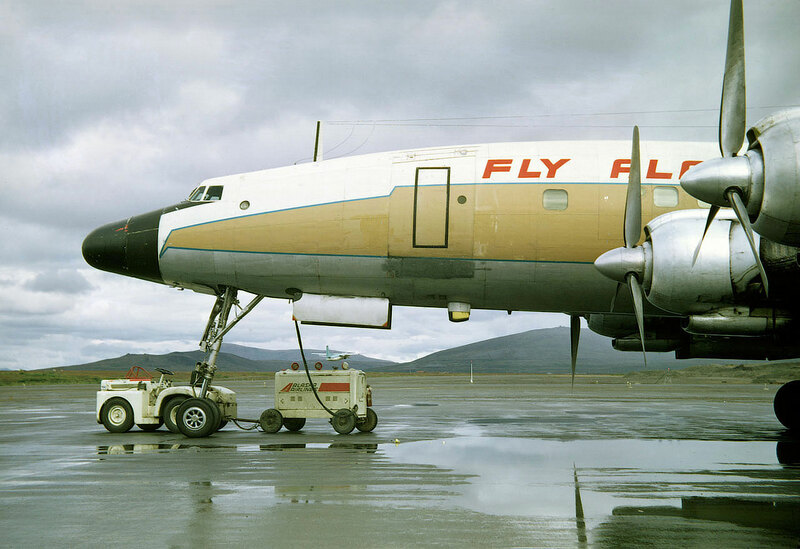 Next day I took the "Champagne Flight" which was a ride in N91239 Convair 240-13 (159) operating "Alaska 201" - after one hour and seventeen minutes, and fueled by copious quantities of Champagne (supplied by Jenny the Stew) I deplaned at Fairbanks at 18:25 local. The fresh air hit me, and I headed off out on the ramp towards an interesting collection of airframes, with a wonderful "quality of light" - perhaps enhanced by the effect of the Champers! I did manage a few snaps before it got dark. 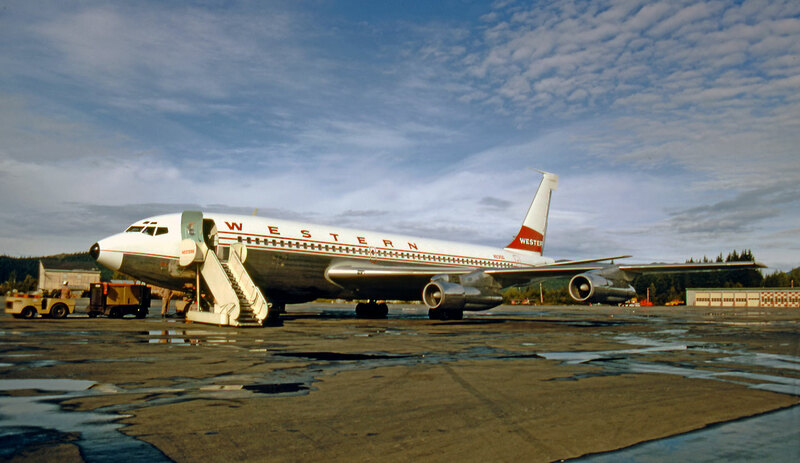 Later, I left on the Convair 880 at 22:37, getting back to Anchorage at 23:15 - 38 minutes, a bit quicker than with the CV240. I slept very soundly on a couch at PANC that night. 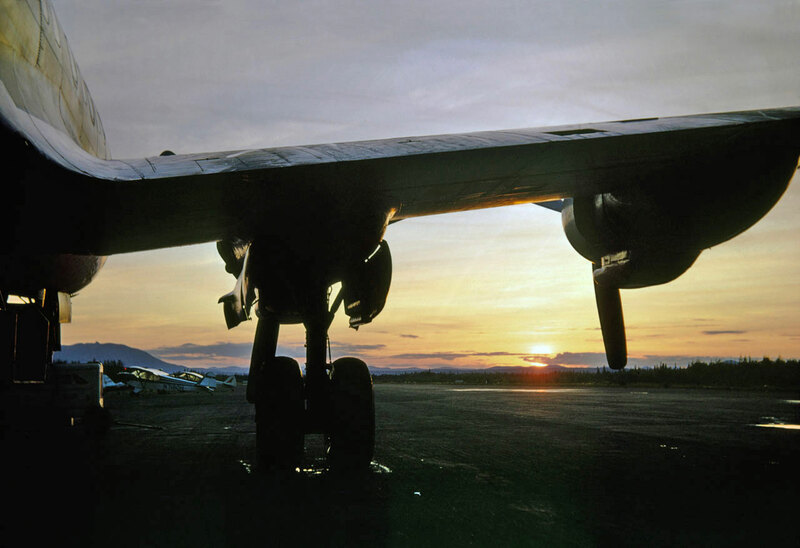 The flight line await my visit at Fairbanks on the early evening of 01 September 1966. 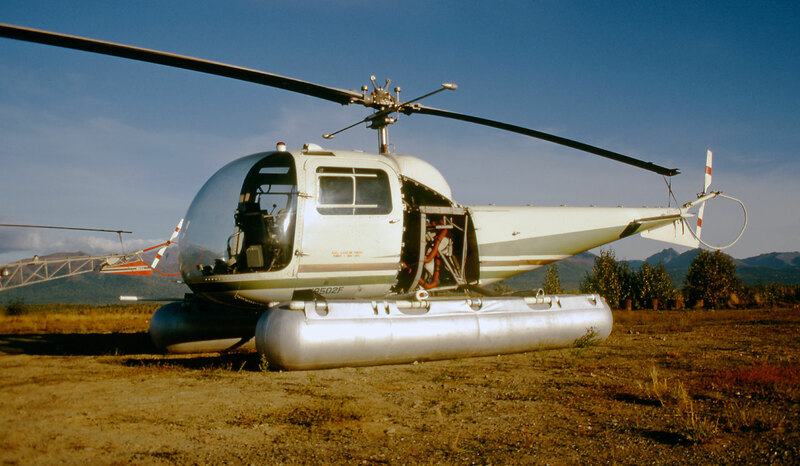 N411A Sikorsky S-55 Whirlwind (55-890). 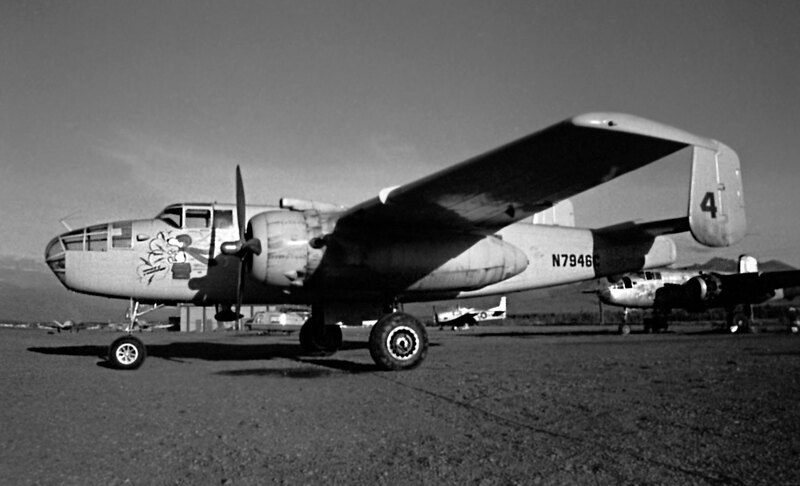 N9857C/4 North American B-25 Mitchell (43-2085); N8193H North American CB-25J Mitchell (108-34251); N9444H North American TB-25J Mitchell (108-33218) "BD-943" still visible. Ex 44-29943. 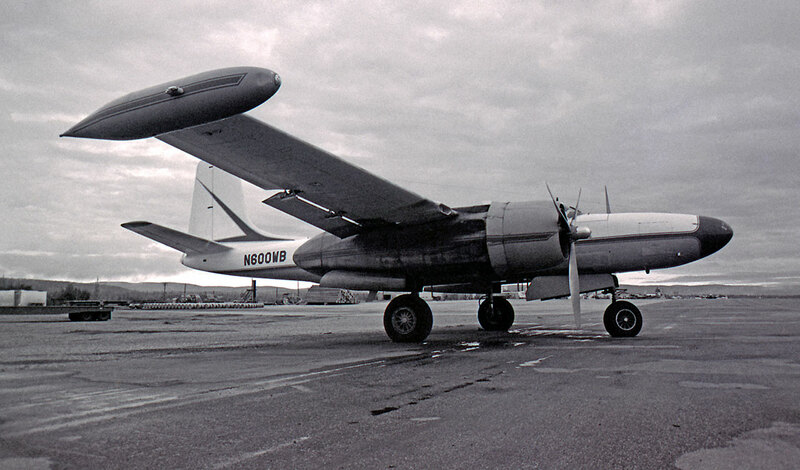 N8009E Fairchild C-82 Packet (10071) ex 44-23027. 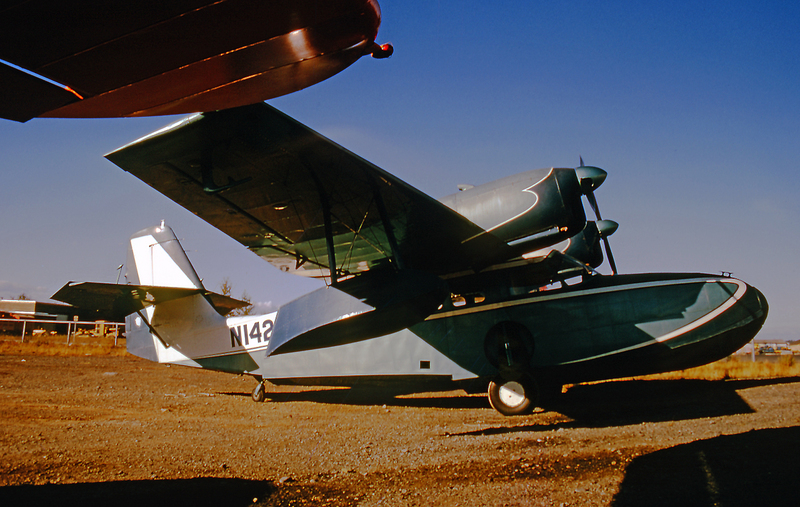 Noted two tone blue dumped at Greybull, WY - October 1997 - Fuselage pod only. 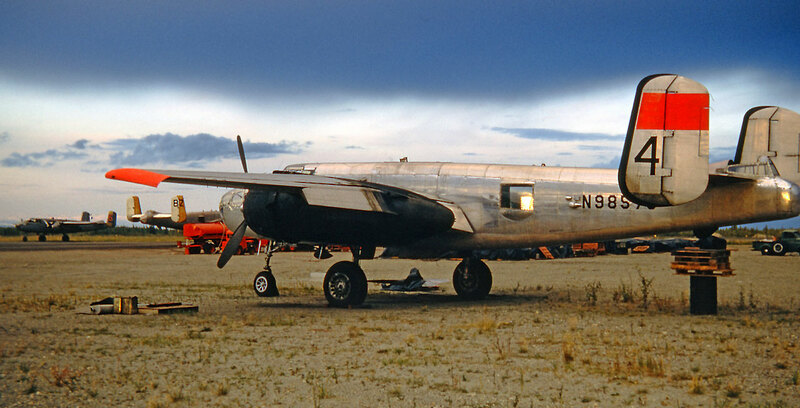 N8196H/5 North American B-25J Mitchell (108-34251) ex 44-86791; N9088Z/8Z North American B-25J Mitchell (108-34008) ex 44-30733; N9857C/4 North American B-25J Mitchell (10835072) ex 43-28059. 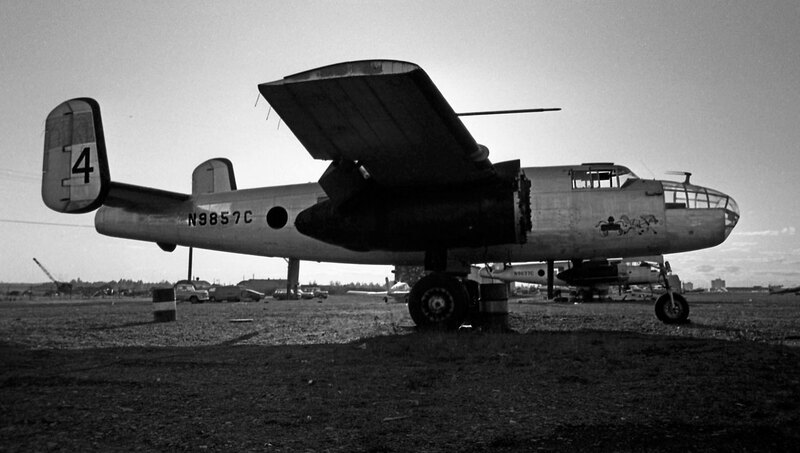 N9937Z/2 North American B-25N Mitchell (108-24236) ex 43-3910A. 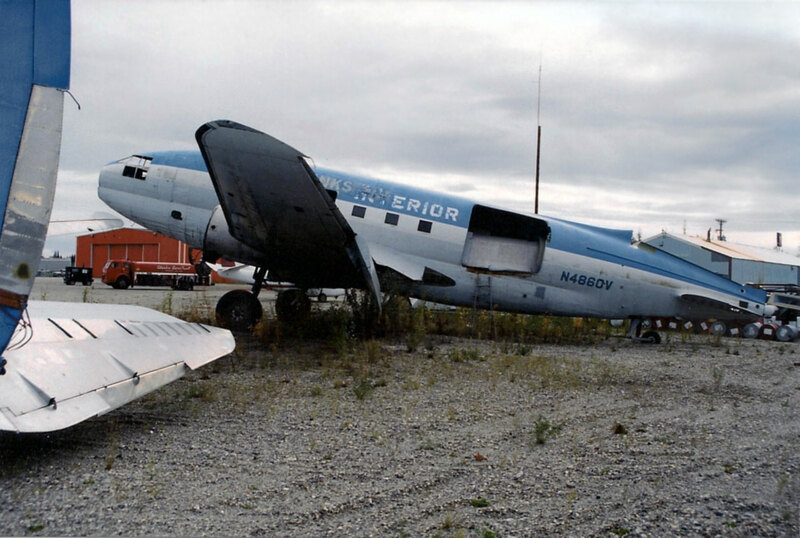 Crashed Rampart, AK. 27 June 1967. 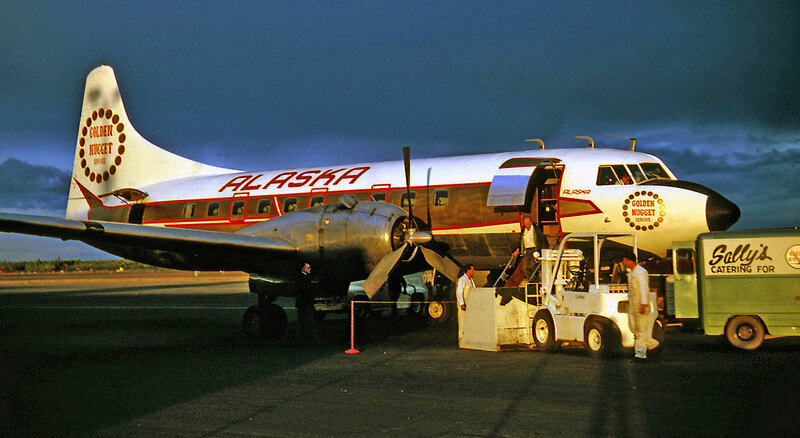 Alaska Airlines had sold their venerable Convair 880, so my ride north from Seattle to Anchorage was on N797AS Boeing B727-90C (19169) shown here on the ramp at Sitka, AK. 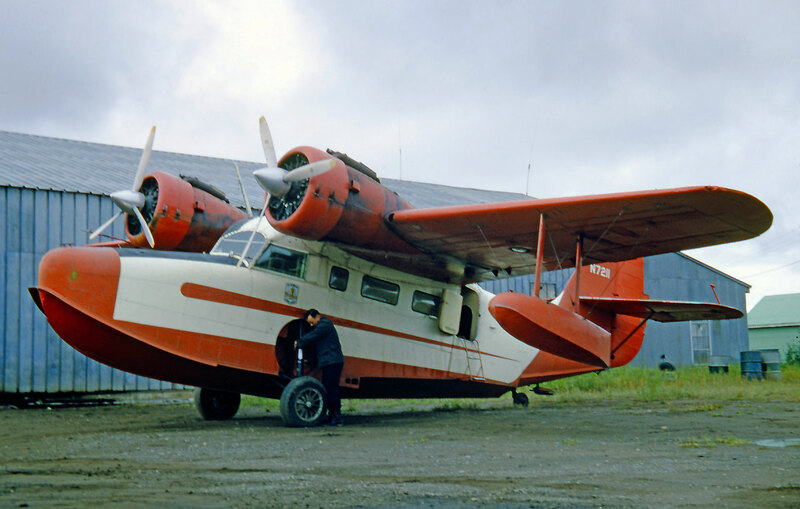 This was my modern mode of transport back to Alaska in 1968. 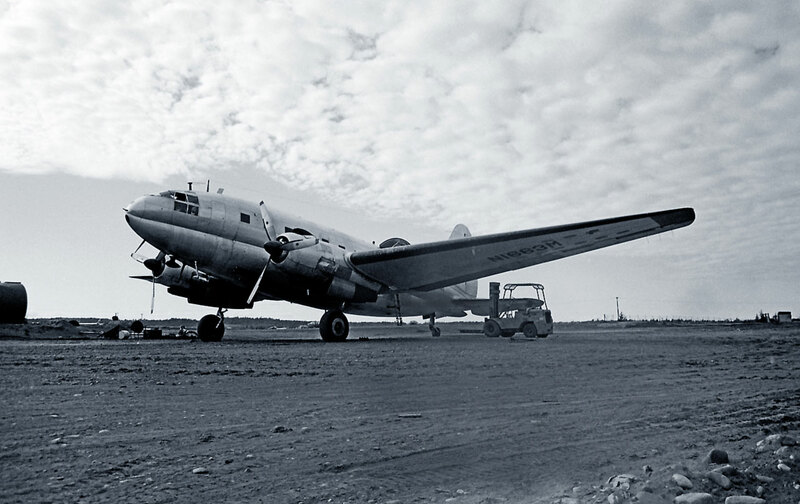 Gravel airfields included, as this aircraft was certified for such landings. 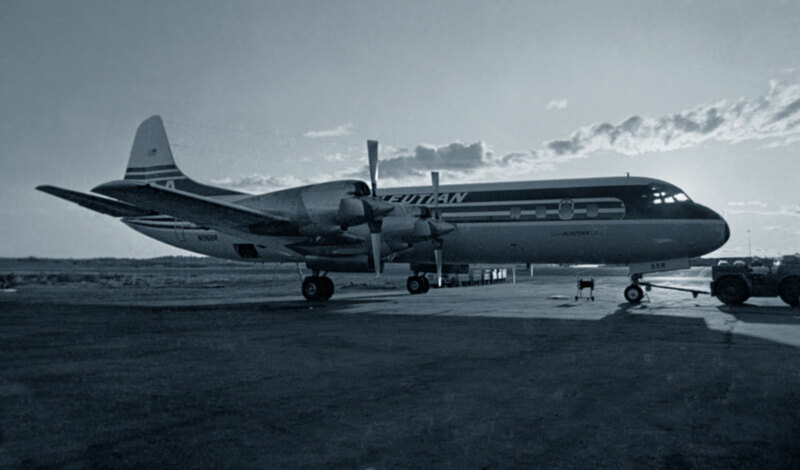 Interesting to note that it was later based close to me at Ottawa, Ontario, with Bradley Air Services/First Air as C-FRST "Spirit of Iqaluit", again servng the far North. Cancelled 20-Apr-2001. 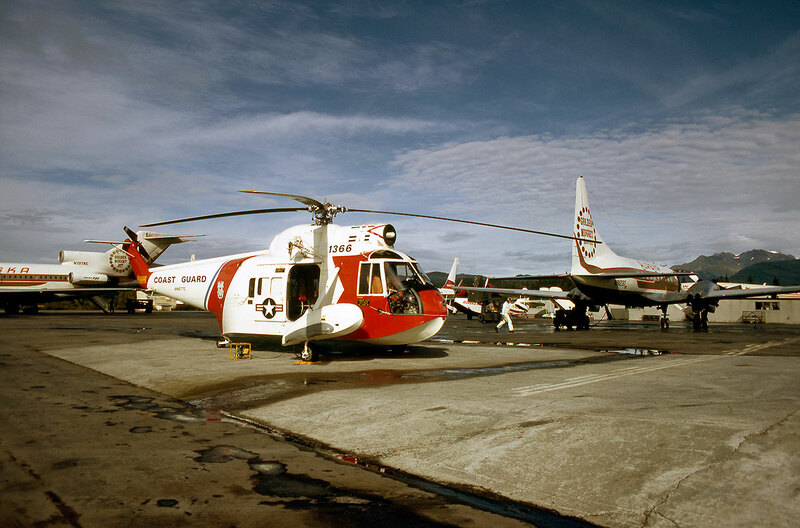 1366 Sikorsky HH-52A Sea Guard (62-044) US Coast Guard based Annette, on the very busy Juneau ramp. Lots to interest two young Scots. Boarding via the rear stairs at Juneau, of N797AS for continuation of flight to Anchorage. 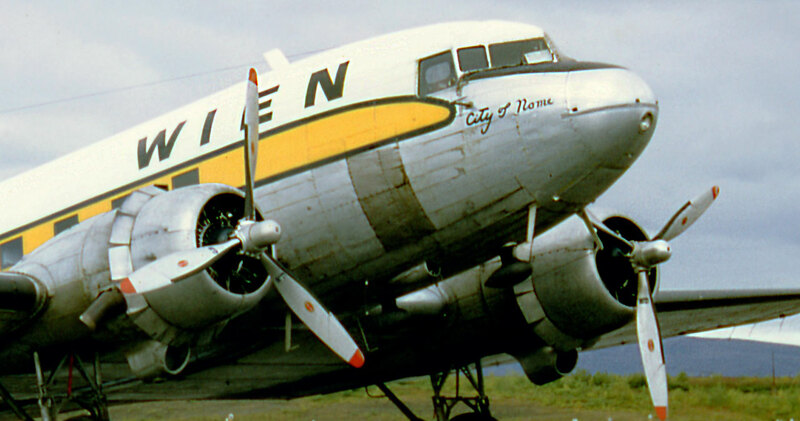 N21748 Douglas DC-3-208A (2106) Wein Consolidated "City of Nome" at Nome! 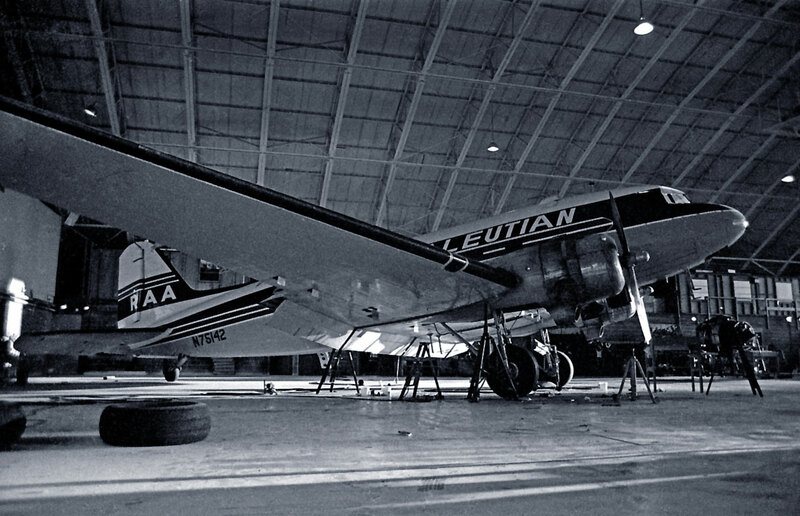 I have no idea why I did not centre this aircraft when taking the photograph. 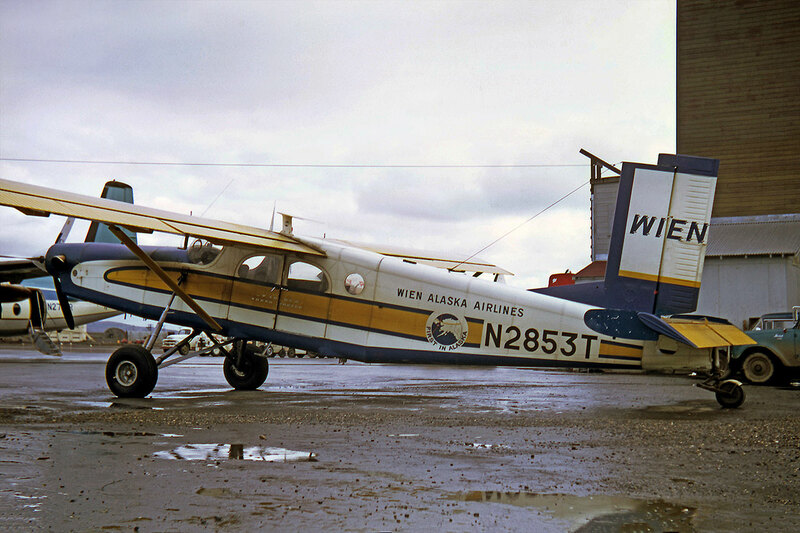 N2853T Pilatus PC-6 Porter (574) Wein Consolidated Airlines at a very dull Nome. 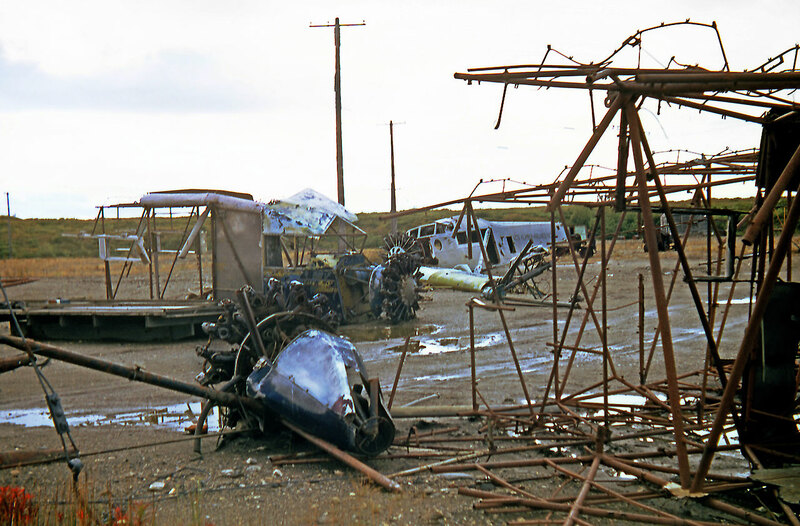 Destroyed 12 August 1969 at Chevak, Alaska. 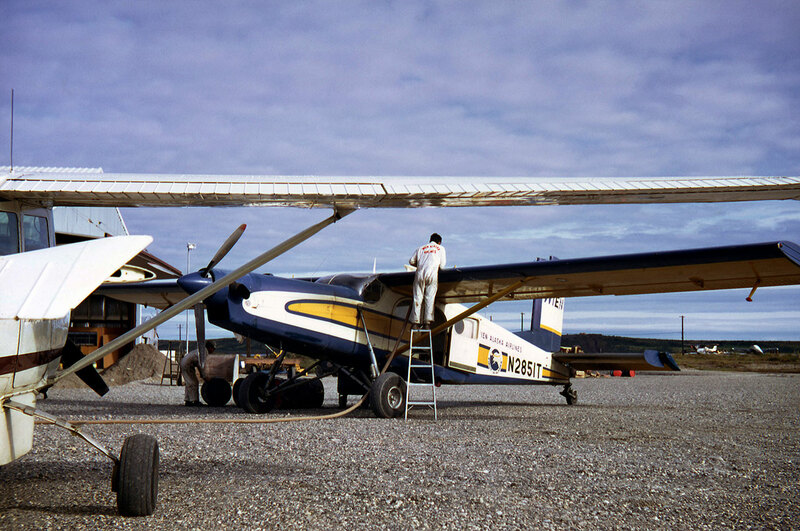 N2851T Pilatus PC-6 Porter (569) Wein Consolidated Airlines (still with Wein Alaska titles) at a brighter Kotzebue getting some fuel. 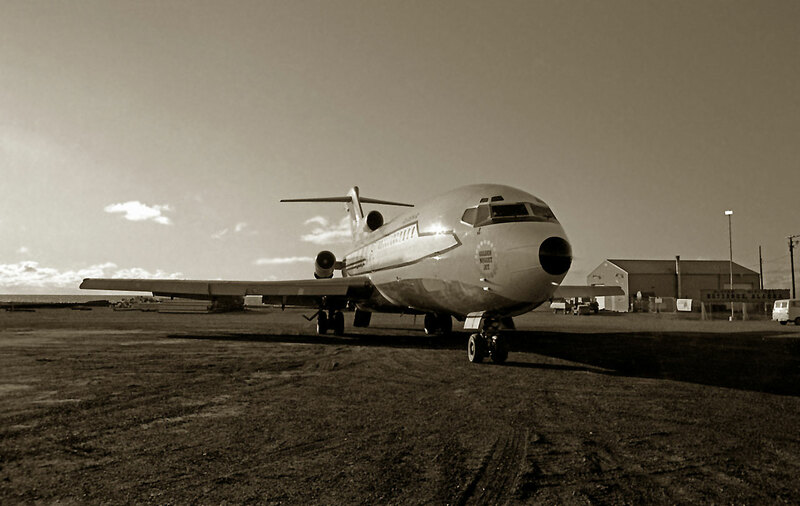 N766AS Boeing 727-90C (19728/536) was my ride to Kotzebue on 15 September 1968. 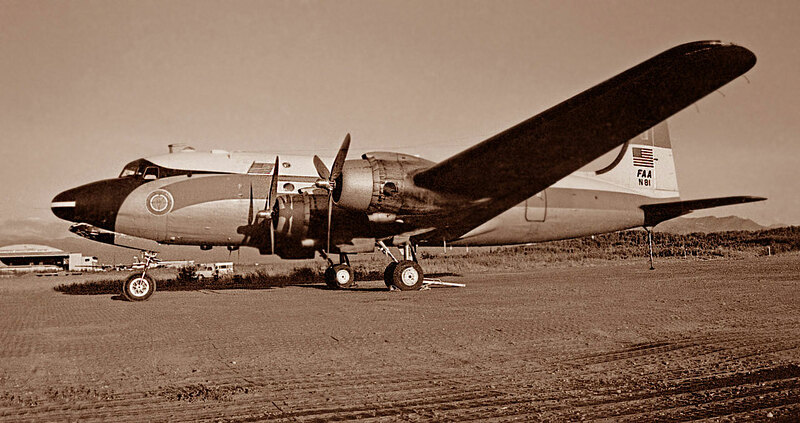 It was a faster trip, but I did miss the Connie. 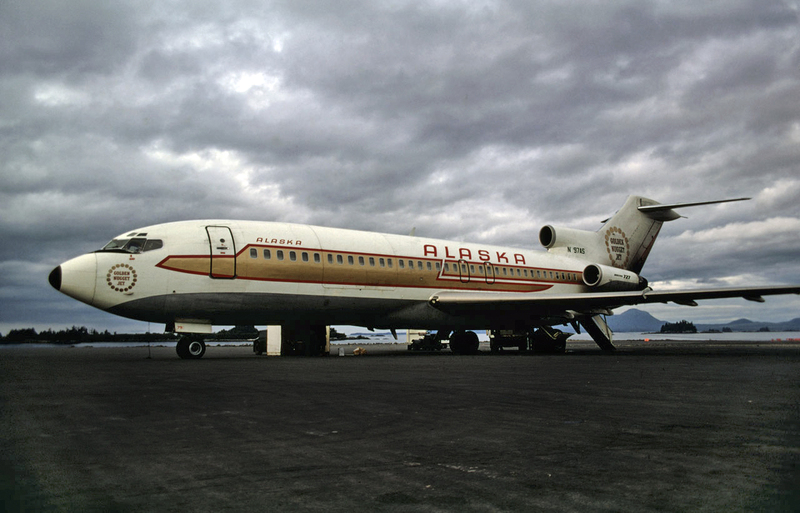 This 727 caught fire, and was destroyed at PANC after mechanics ran it into jetway inadvertantly on 09 June 1987. An ignominious end after 49,937 hours in nineteen years and four months of safe flight! 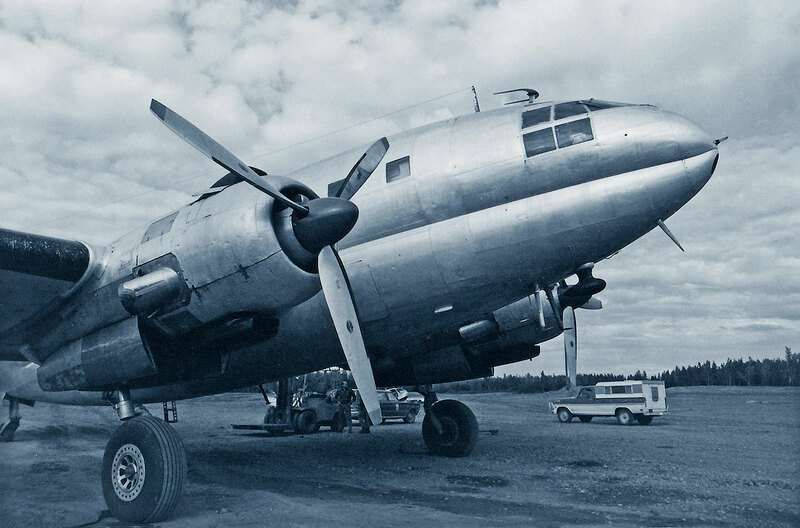 N7777G Lockheed L-749A Constellation (2553) Wein at Fairbanks. Top photo: Tom Baillie © 15 September 1968. Lower photo: Neil Aird © 15 September 1968. 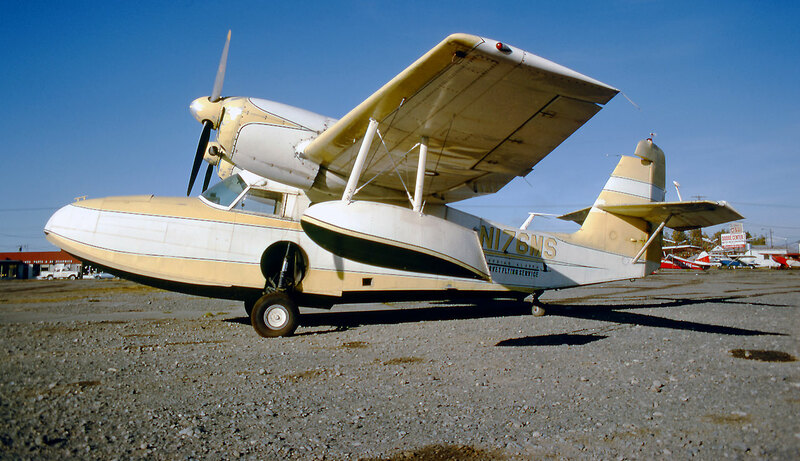 N73598 Cessna T-50 Bobcat (3012) Northern Consolidated Airlines. 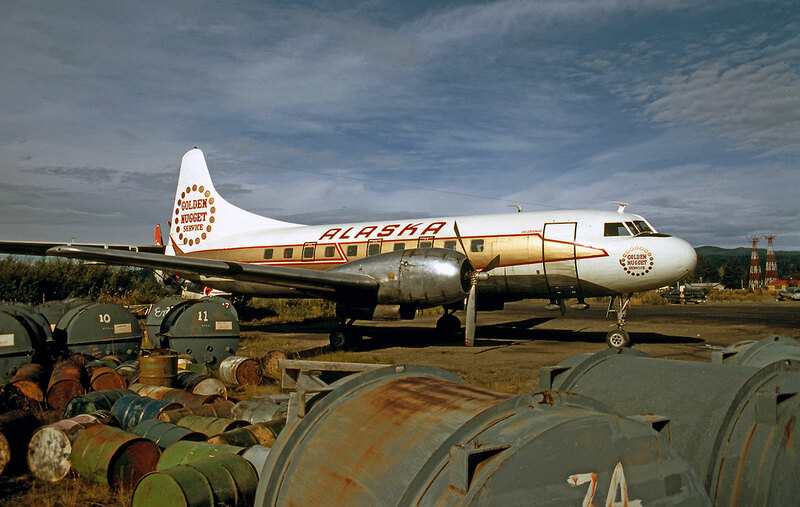 Out to pasture at Anchorage 02 September 1966. 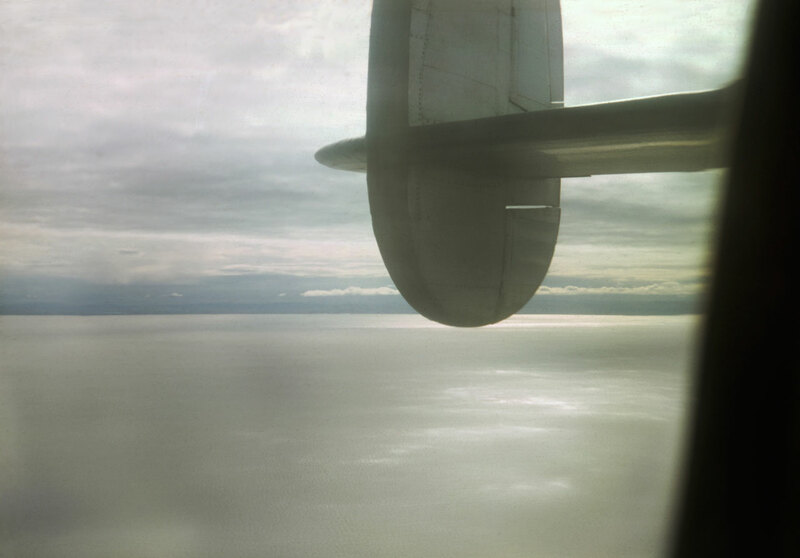 Note the five C-123 Providers at the base in the distance. 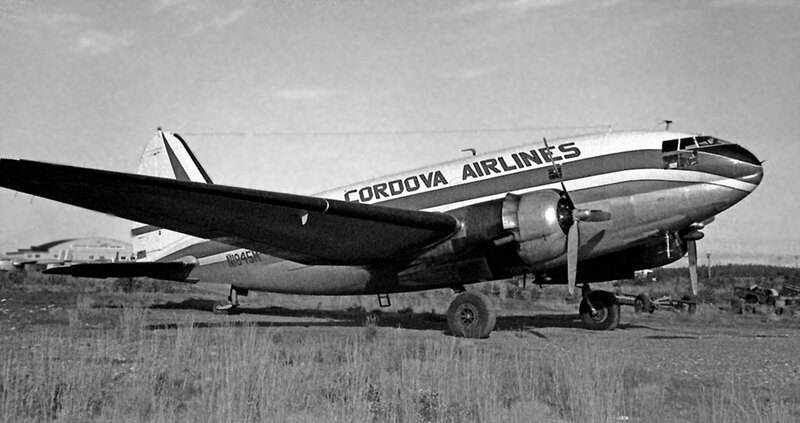 N1845M Curtiss C-46 Commando (22497) Cordova Airlines at Anchorage, 02 September 1966. 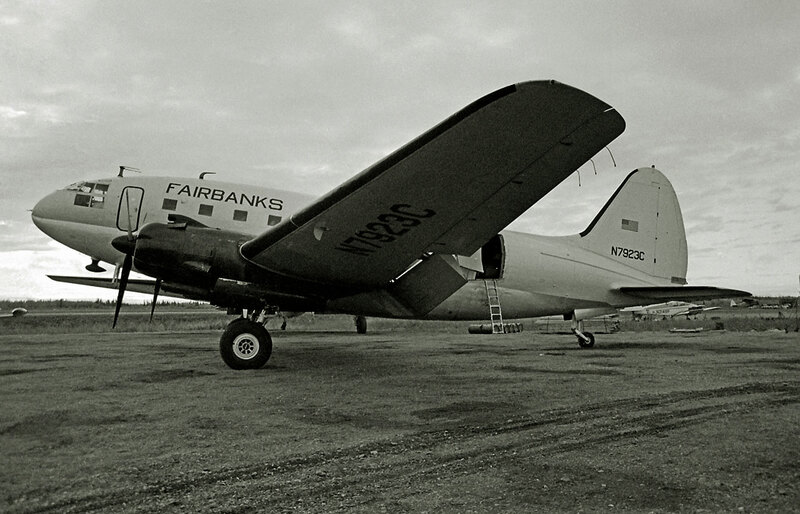 Typical ramp scene at Fairbanks, a bare metal Curtiss C-46 Commando N4860V (30240) of Interior Airways awaits tasking. 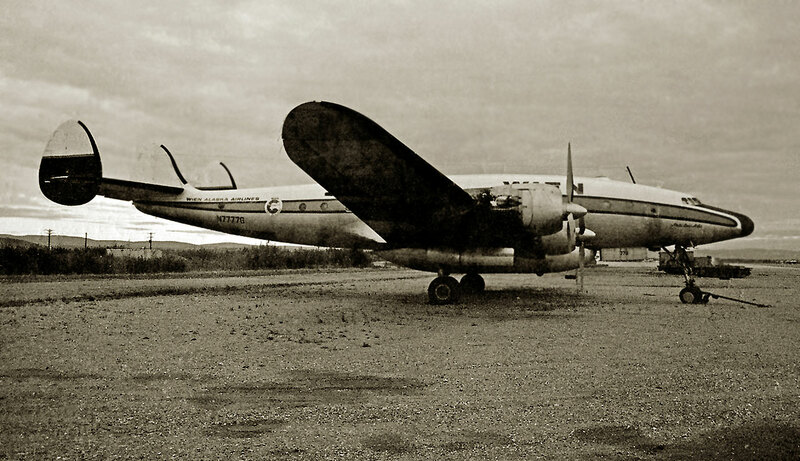 Note the elderly Fairchild C-82 Packet N-209-M still active. 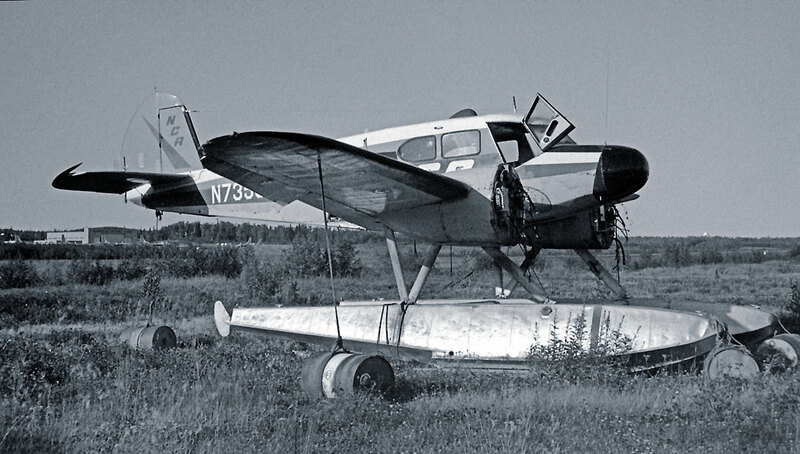 I met up with this Commando again in September 1995 where I found it out to pasture at Fairbanks. 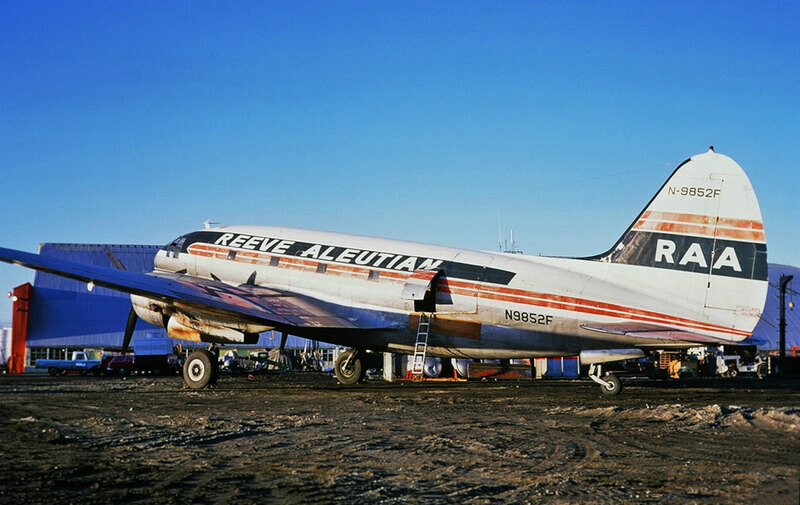 It had come to grief on 27 March 1975 (NTSB ANC75AA071) at Deadhorse Airport, Prudhoe Bay. 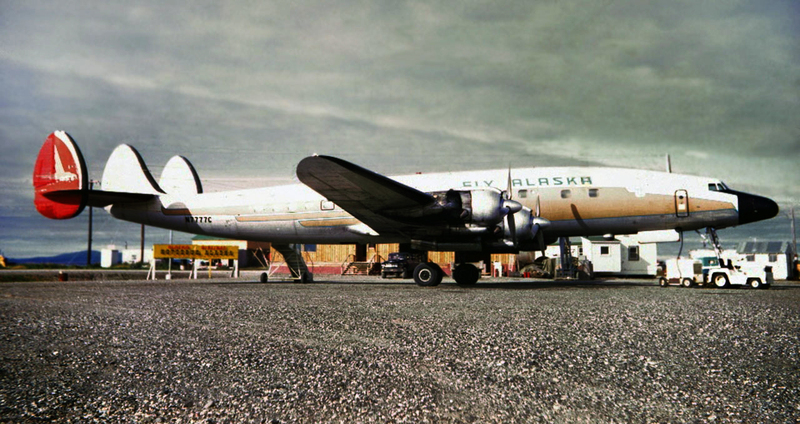 Below is a colour photo of it at Fairbanks. 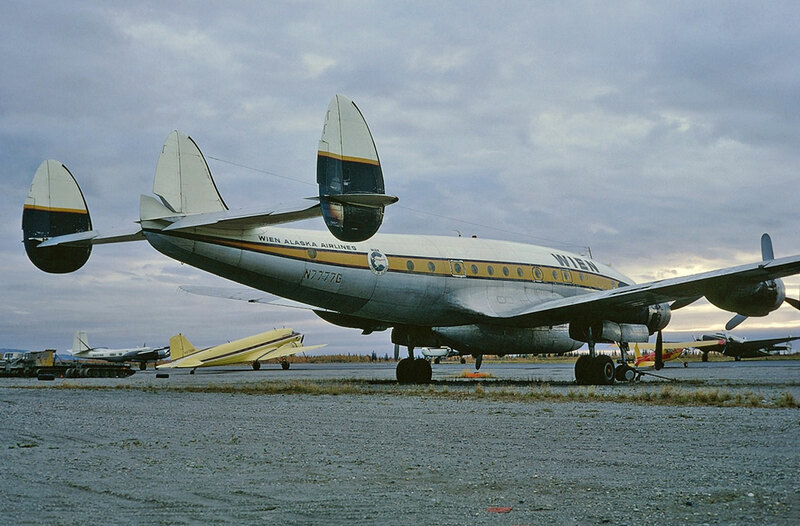 N1663M Curtiss C-46F-1-CU Commando (22548) at Anchorage 02 September 1966. We met again several times over many years, often the case with these long lived ships. 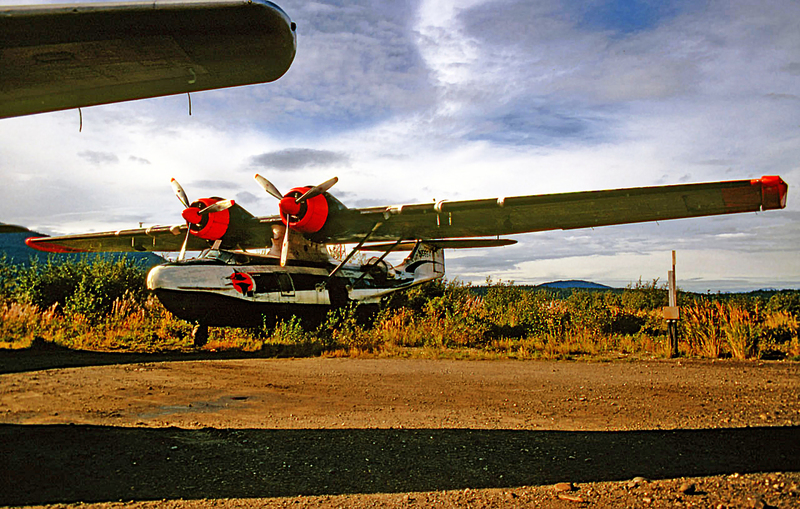 N1968R Lockheed L-188C Electra (2007) Reeve Aleutian basking in an Alaskan Sunset. 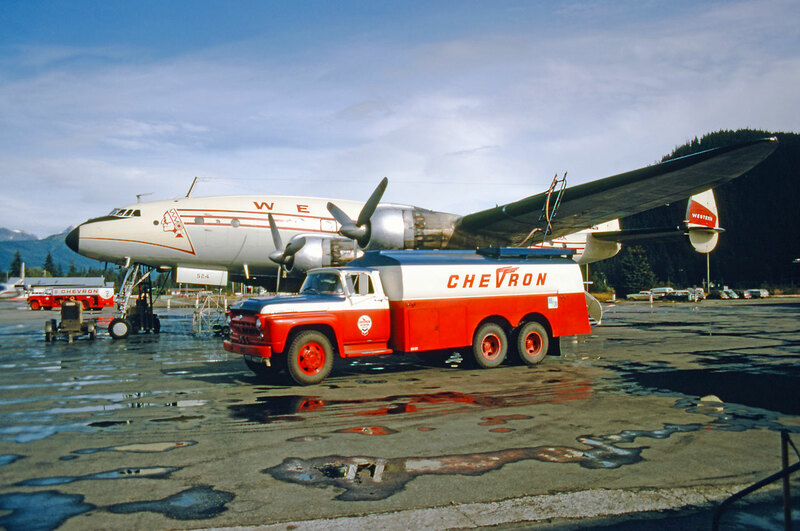 It started off as VH-ECC, then became ZK-CLX, and finally C-GHZI (Tanker 484). We meet again. 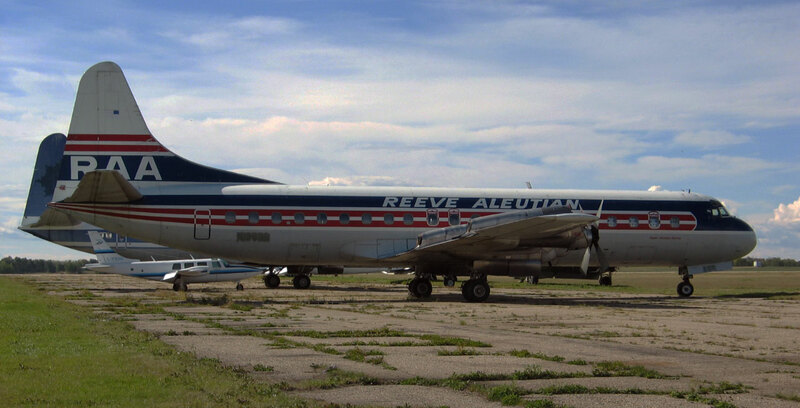 Here, ex N1968R sits at Red Deer, Alberta awaiting conversion to a tanker. 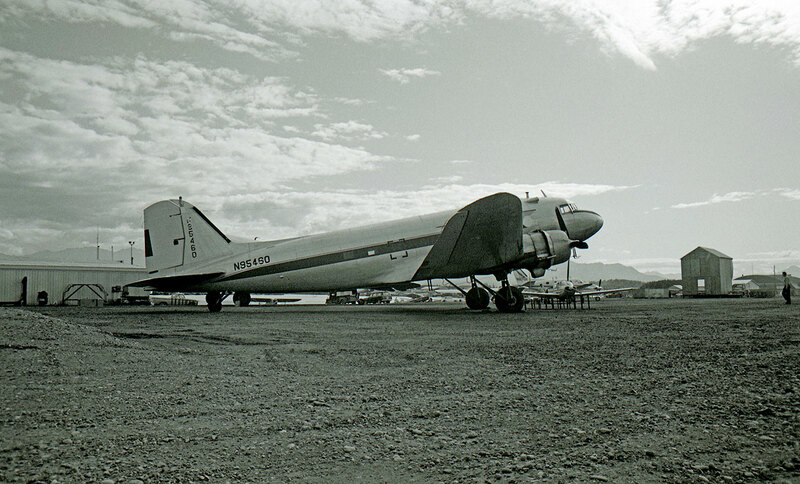 N91067 Douglas C-54A-5-DC Skymaster (10295) Reeve Aleutian at Anchorage on 01 September 1966. 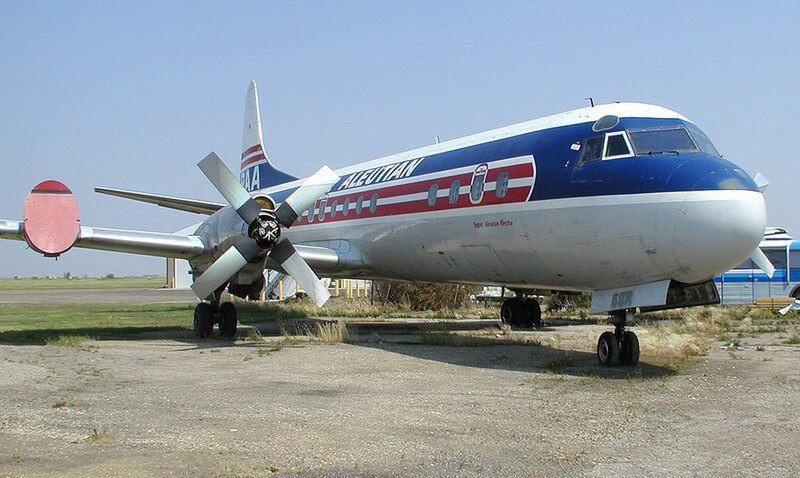 Ex Capital Airlines. 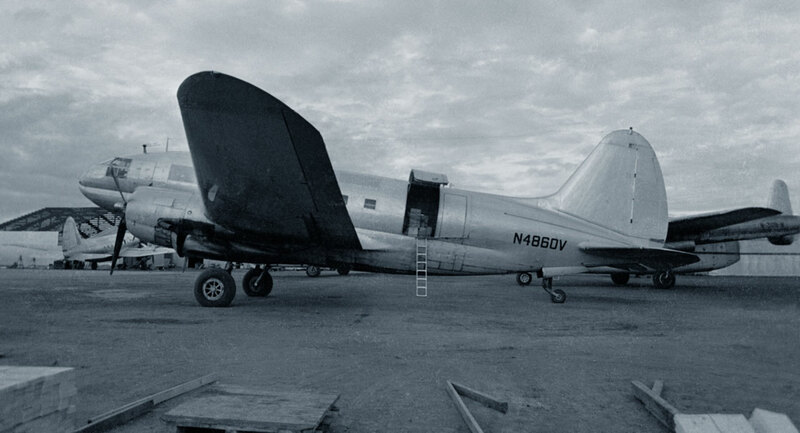 N9852F Curtiss C-46A-35-CU Commando (26792) Reeve Aleutian. Top photo: Neil Aird - Lower photo: Tom Baillie. 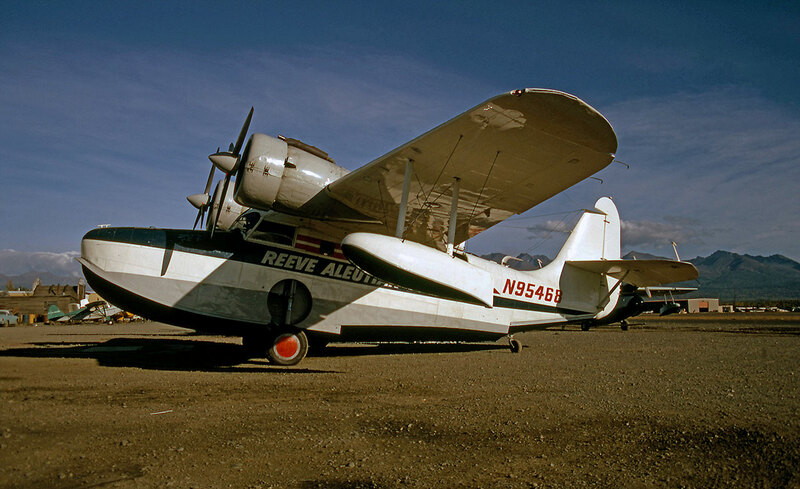 N95468 Grumman G-21A Goose (1140) Reeve Aleutian, at Merrill Field. w/o near Dutch Harbour, 23 January 1981, 2K. 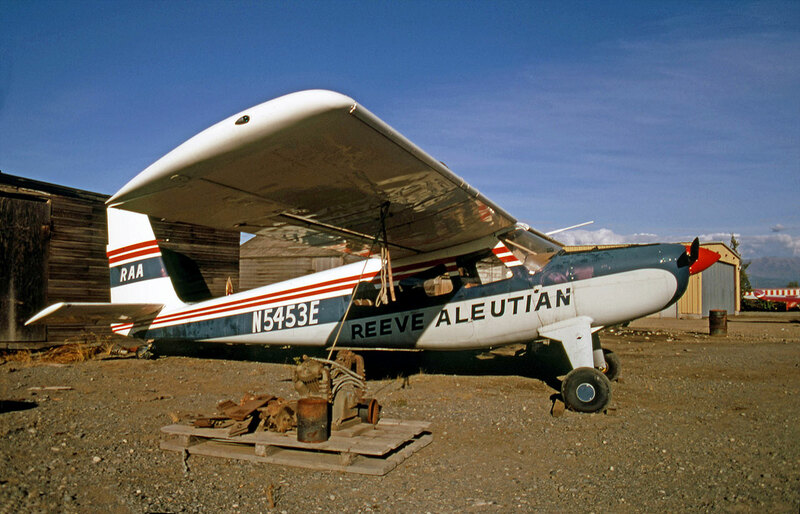 N5453E Helio H-250 Courier (2510) Reeve Aleutian, at Merrill Field. 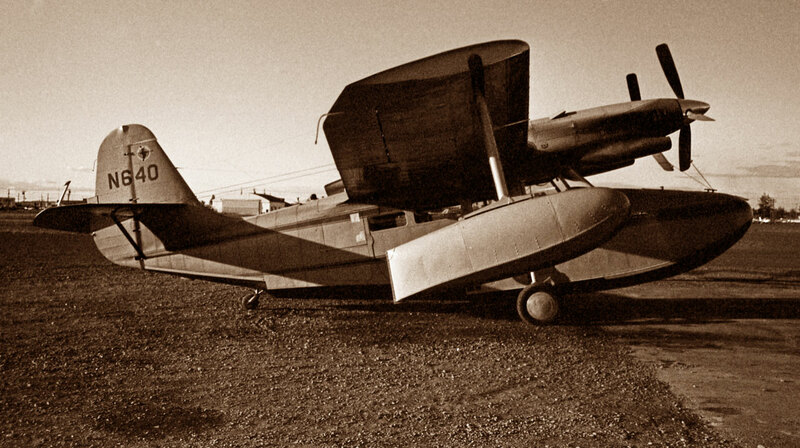 Later became C-GIDG. 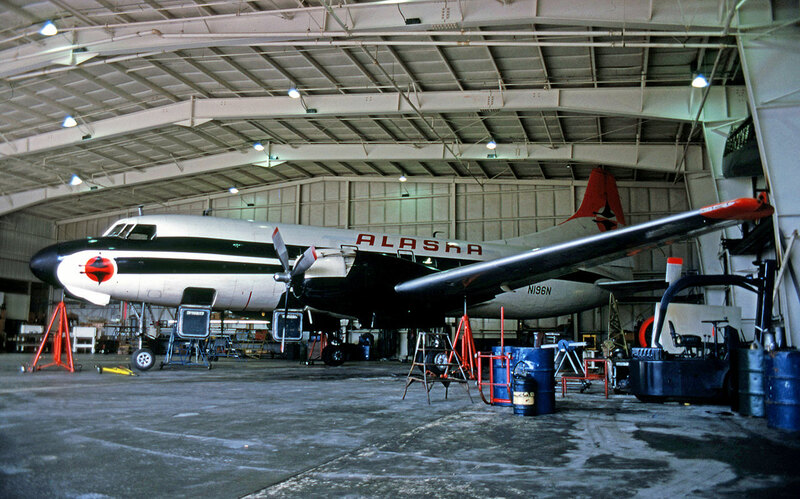 N51331 Convair 240-0 (76) Alaska Airlines, at Juneau. 14 September 1968. 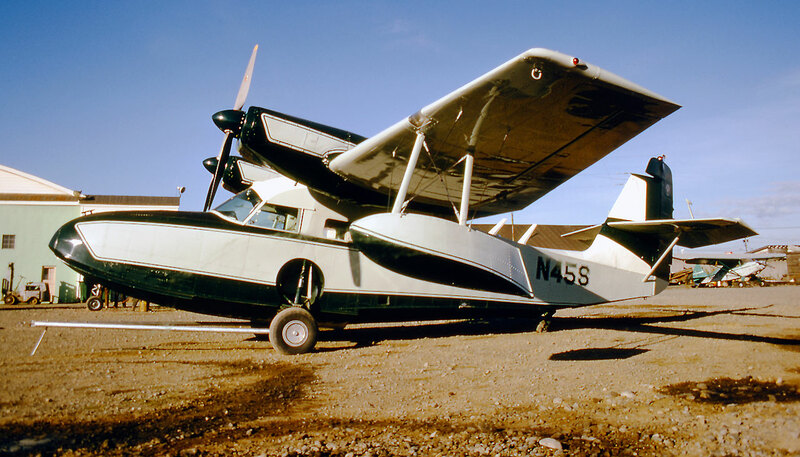 Ex NC94238; JA5110; b/u Long Beach 07 June 1979. 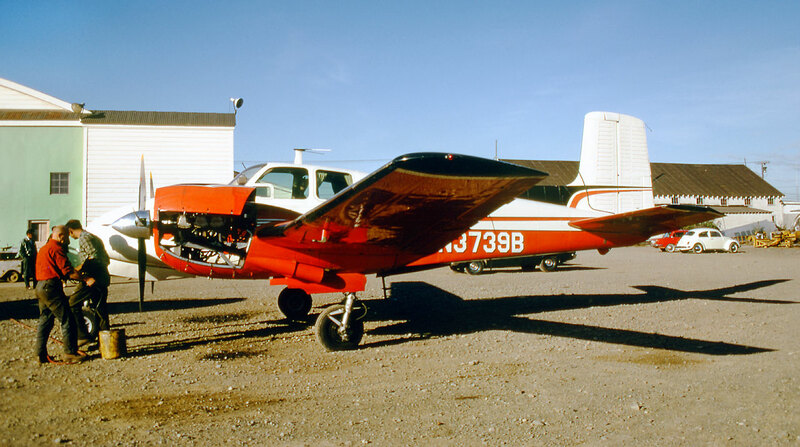 Fuselage noted at El Mirage October 1992. 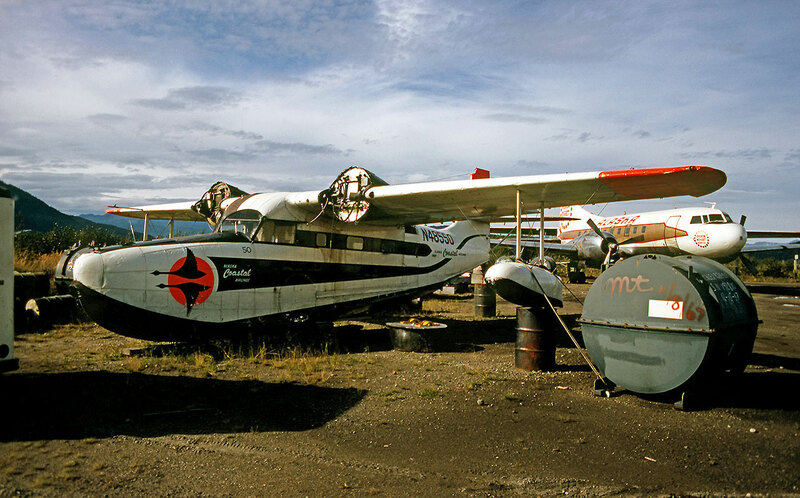 N48550 Grummand G-21 Goose (1061) Reeve Aleutian, resting at Juneau. 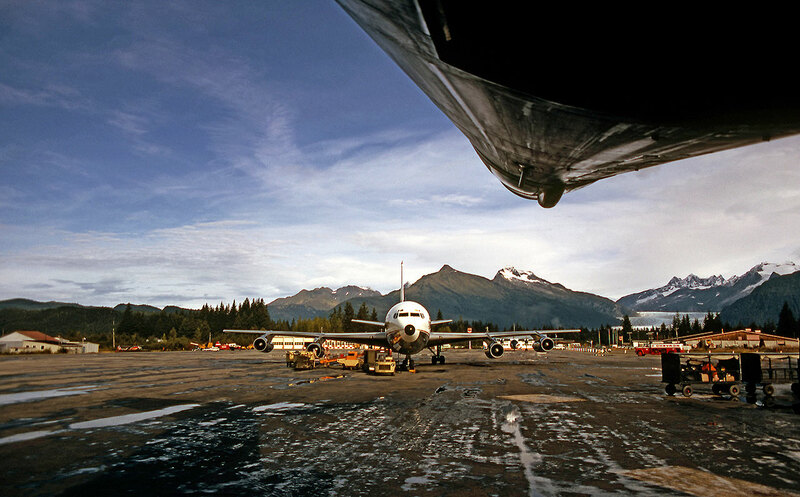 N196N Convair 240-5 (42) Alaska Coastal, on jacks at Juneau. 14 September 1968. 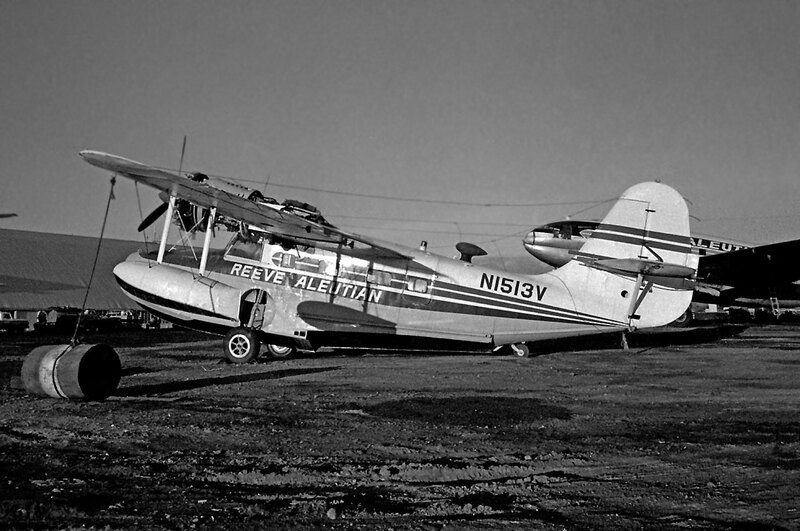 Ex VH-TAP; AP-AHO; PH-NHZ; N557R b/u Long Beach 06 June 1979. 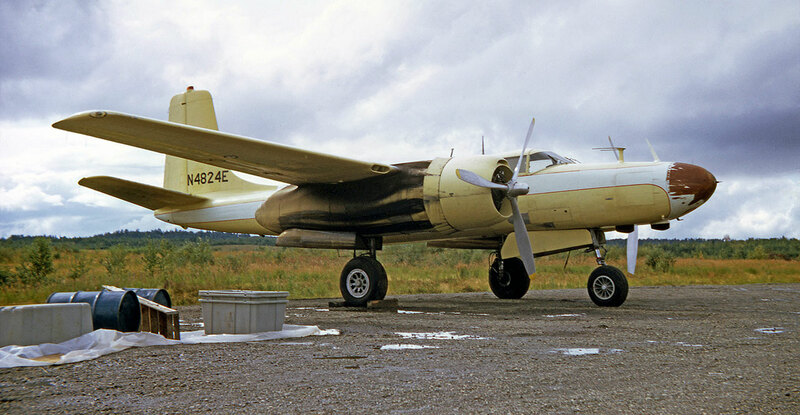 N640 Grumman / McKinnon G-21A Turbo-Goose (B-123) ex BuNo 87729 at Merrill Field. 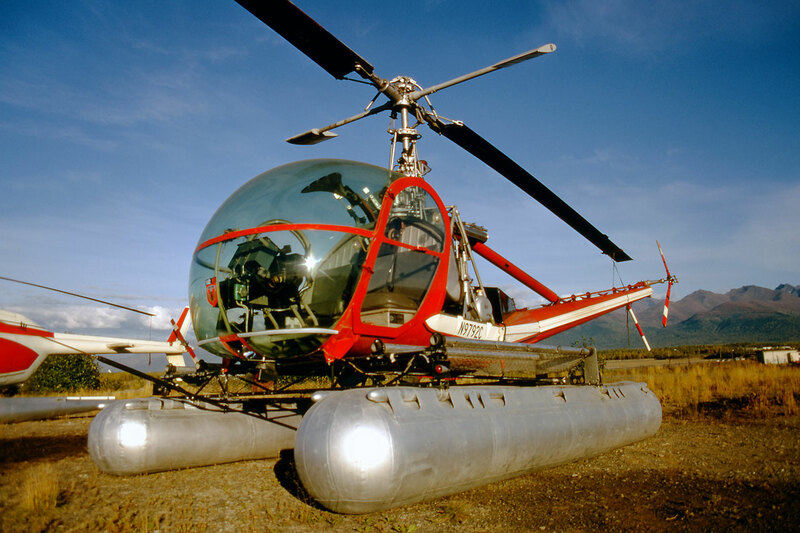 N4048G Bell 205A (30010) of ERA (written off near Tyonek 02 January 1969) with N874 Sikorsy S-55B (55-1004) (written off Beaumont, California 29 March 1981) at Merrill Field - 14 September 1968. 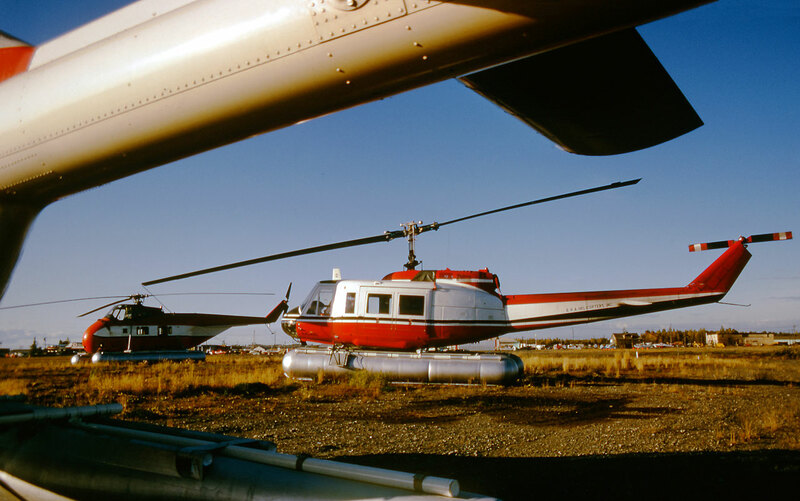 N9792C Hiller UH-12E (2277) parked next to N7817S Bell 206A Jet Ranger (17) at Merrill Field - 14 September 1968. N8502F Bell 47J-2A (3308) visiting from Fairbanks at Merrill Field. 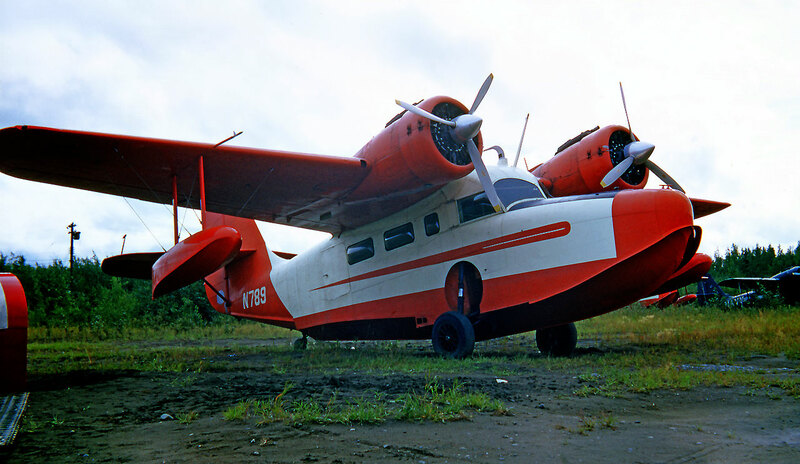 N3739B Beech D-50 Twin Bonanza (CH-163) of puget Sound Tug & Barge Company, buit in 1955. Again, at Merrill 14 September 1968. 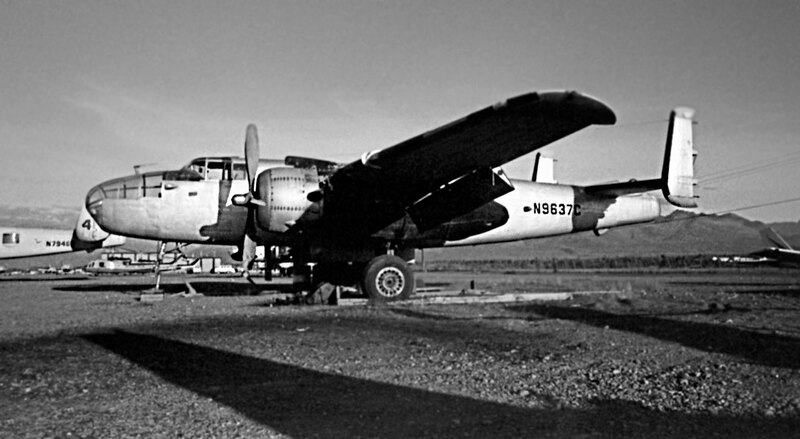 N600WB On Mark Marksman B-26 (28896), on the expansive Fairbanks ramp. 15 September 1968. 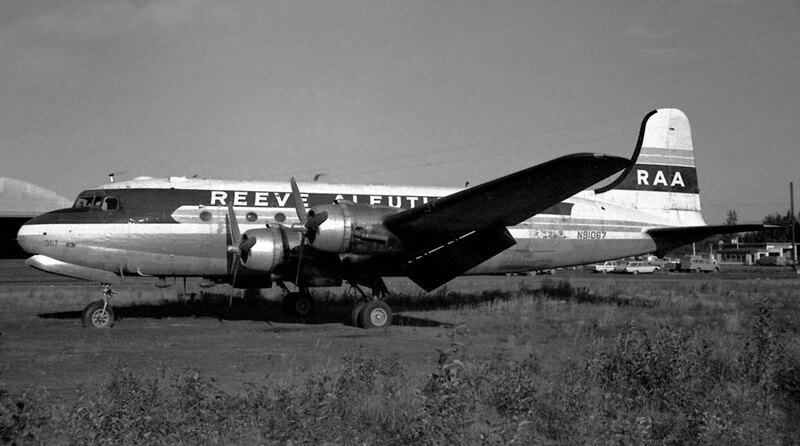 Ex 44-35617 RB-26C converted first to On Mark Marketeer N7660C. 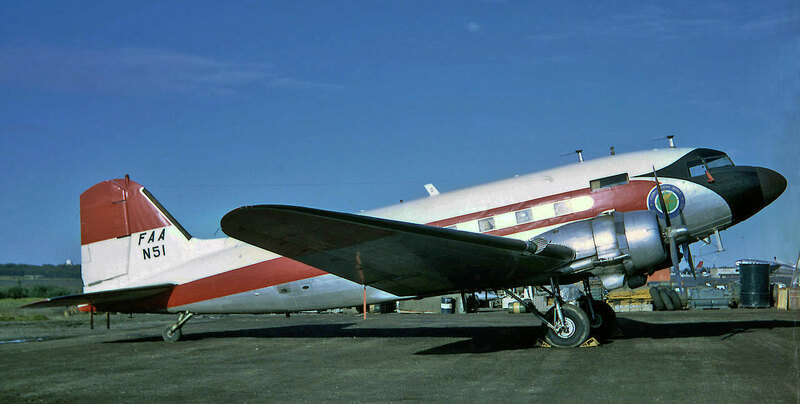 N2768A Douglas DC-3C Dakota (25980) "Something Special" ex 43-48719A; later N10HB; CF-BXY; C-FBXY and currently N68CW, parked next to N600WB. 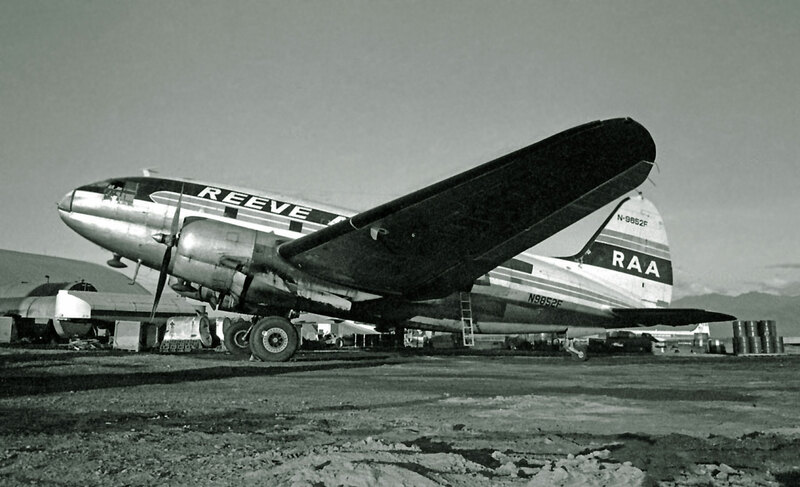 The biz jets of years gone by. 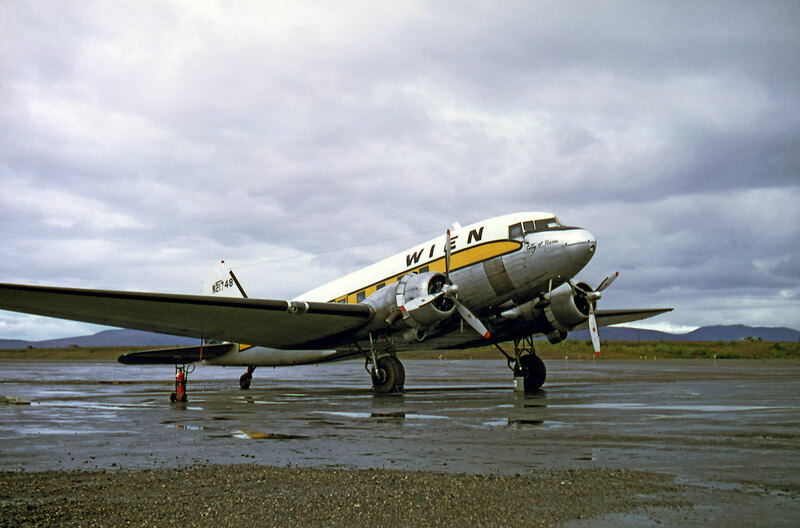 N62 Douglas DC-3 Dakota (14506/25951) FAA with sister ship N51 (11928) in the background, at Anchorage - PANC. 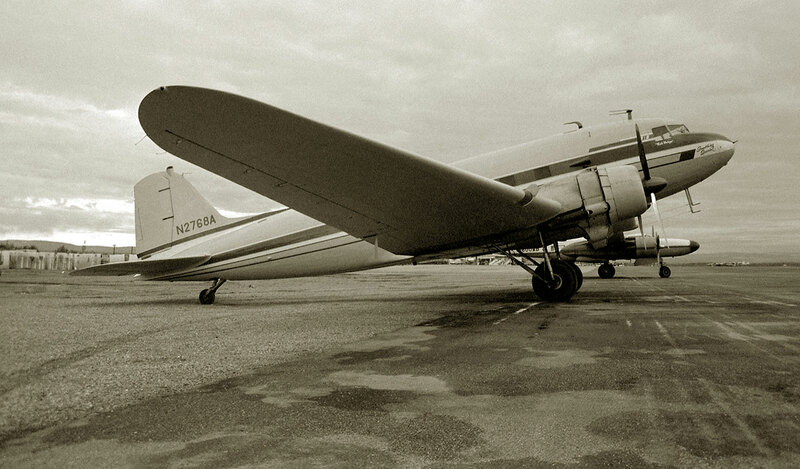 N49319 Douglas DC-3 Dakota (15231/26676) with traces of PNA titles. 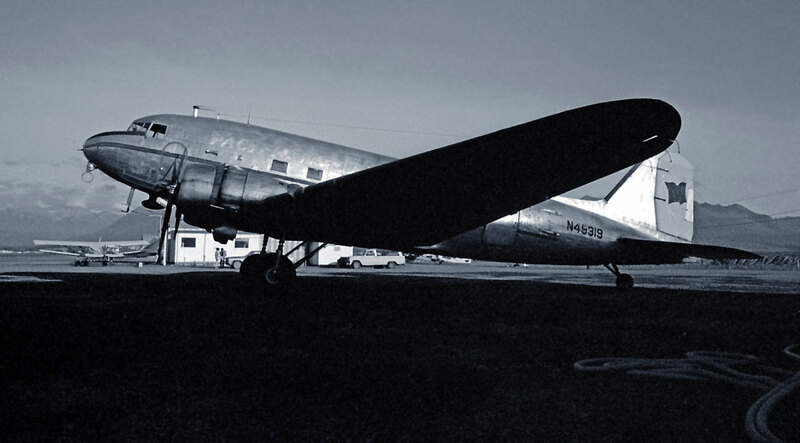 N95460 Douglas DC-3C Dakota (20190) ex 43-15724. 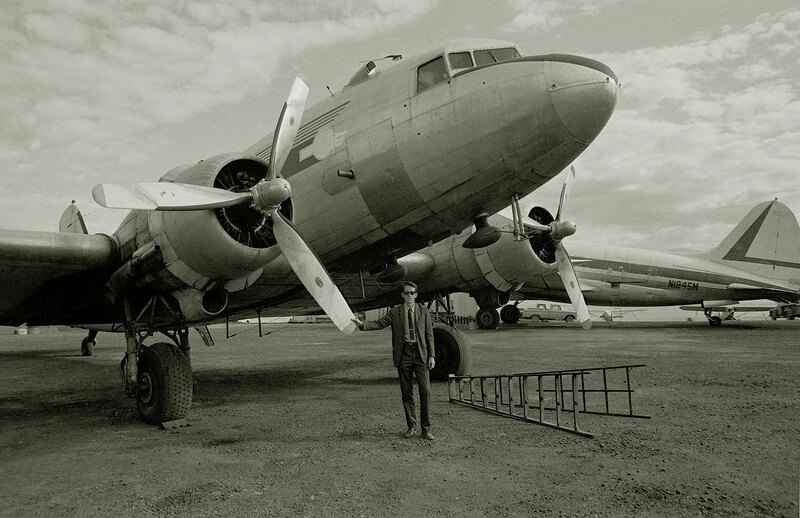 I met up with this airframe at Fairbanks many years later. A twenty-three year old in "Heaven" . . . . . .